Twelfth Bough: what happens when the butcher dies? Almost five years after a massive stroke plunged Ariel 'Arik' Sharon into a deep and irreversible coma, preparations are under way for Israel's legendary old warhorse to return home to his vast Sycomore ranch on the northern fringe of the Negev desert, not far from Gaza. As was inevitable, news of Sharon's transfer revived speculation about how history will treat him after he dies, which for all his dedicated medical team's efforts is unlikely to be too far off. 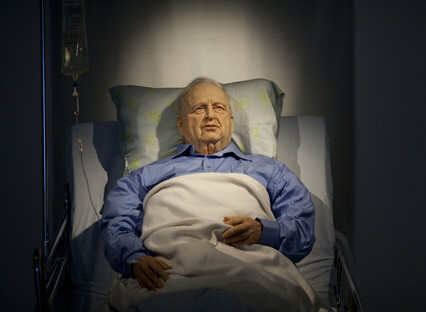 ...The move comes three weeks after the Berlin-based Israel artist Noam Braslavsky unveiled a sculpture (above) of Sharon in his hospital bed. It is on display at the Kishon Gallery in Tel Aviv until November 19. Sharon, the butcher. He butchered human beings at Sabra and Shatila. A few months before Rabbi Yitzchak Kaduri died, he was reported to have written the name of the Messiah on a piece of paper that was sealed in an envelope. This envelope was opened a year after the Rabbi died at the age of 108. He also was reported to have stated that Messiah will appear after the death of Ariel Sharon. You never know when people will try to fit the facts around the prophecy. when the American Embassy in Beirut was destroyed in an explosion. She had arrived there minutes earlier to advocate for more aid to the Shia of South Lebanon and for the Palestinians at Sabra, Shatilla, and Burg al Burajneh camps, conditions which arose due to Israel’s 1982 invasion and the September 15-18 massacre. She was pregnant with their son when she died. [Janet wrote to Franklin] “I saw dead women in their houses with their skirts up to their waists and their legs spread apart; dozens of young men shot after being lined up against an ally wall; children with their throats slit, a pregnant woman with her stomach chopped open, her eyes still wide open, her blackened face silently screaming in horror; countless babies and toddlers who had been stabbed or ripped apart and who had been thrown into garbage piles”. Remember that fellow you once screamed at and called a butcher outside of Phalange HQ in East Beirut, Joseph Haddad. At the time he denied everything as he looked you straight in the eye and made the sign of the cross. cocaine, hashish and alcohol to increase their courage. He and others gave their stories to Der Spiegel and various documentary film makers. opened fire. She still explains like it was yesterday, how the condoned slaughter unfolded, recalling each of her four sons by name, Nizar, Shadi, Farid and Nidal. I asked Joseph if he wanted to sit with Um Ahmad and seek forgiveness and possible redemption since he has now become a lay cleric in his Parish. He declined but sent his condolences with flowers. That trash dump near the Sabra Mosque is now a mountain. Yesterday I did a double take as I walked by because I saw three young girls-as sweet and pretty as ever I have seen–maybe 7 to 9 years old in rags picking thru the nasty garbage. Their arms were covered with white chemical paste. Apparently whoever sent them to scavenge sought to protect them from disease. As I climbed thru the filth to give them my last 6,000 LL ($4) they managed a smile and giggle when I slipped on a broken thin plastic bag of juicy cactus fruit skins and plunged to my knees. ELIE HOBEIKA, the Chief of Lebanese Forces Intelligence, who along with Sharon master-minded the actual massacre fell out with the Phalange in 1980s under suspicion that he was involved in killing their leader, Bachir Gemayal. He defected to the Syrians, acquired three Ministerial posts in post-civil war Lebanon Governments, including Minister of the Displaced (many thought he knew a lot about this subject) of Electricity and Water and in 1996, Social Affairs. On January 24, 2002, twenty years after his involvement at Sabra-Shatilla he was blown up in a car bomb attack in East Beirut. Two of his associates who were also rumored to be planning to “come clean” regarding Sharon’s role were assassinated in separate incidents. A few days before Hobeika’s death he stated that he might reveal more about the massacre and those responsible and according to Beirut’s Daily Star staff who interviewed him, Hebeika told them that his lawyers had copies of his files implicating Sharon in much more than had become public. These files are now is the possession of his son who following Sharon’s death may release them to the public. The role of Elie Hobeika in the massacres is questionable. He was assassinated on January 24, 2002. Click through for many pictures of Ariel Sharon and others. interests for decades to come." transport plane, in full view of dozens of witnesses, including members of the Lebanese army and others. SLA troops under the command of Major Saad Haddad were slipped into the camps to commit the massacres. The SLA troops were under the direct command of Ariel Sharon and an Israeli Mossad agent provocateur named Rafi Eitan. Hobeika offered evidence that a former U.S. ambassador to Lebanon was aware of the Israeli plot. In addition, the IDF had placed a camera in a strategic position to film the Sabra and Shatilla massacres. Hobeika was going to ask that the footage be released as part of the investigation of Sharon. After announcing he was willing to testify against Sharon, Hobeika became fearful for his safety and began taking precautionary moves. Hobeika was not aware that his threats to testify against Sharon had triggered a series of fateful events that reached well into the White House and Sharon's office. On Jan. 24, 2002, Hobeika's car was blown up by a remote controlled bomb placed in a parked Mercedes along a street in the Hazmieh section of Beirut. The bomb exploded when Hobeika and his three associates, Fares Souweidan, Mitri Ajram, and Waleed Zein, were driving their Range Rover past the C4-laden Mercedes at 9:20 am Beirut time. The Range Rover's four passengers were killed in the explosion. In case Hobeika's car had taken another route through the neighborhood, two additional parked cars, located at two other choke points, were also rigged with C4. The powerful bomb wounded a number of other people in the vicinity. Other parked cars were destroyed and buildings and homes were damaged. The Lebanese president, prime minister, interior minister and the Military Prosecutor, all claimed that Israeli agents were behind the attack, which was partially true, but they also knew this to be, a CIA operation par excellence, since the Chief Architect of the "Local" plans, timing , etc. was Jamil El-Sayyed , the head of the Surete Generale, with direct assistance from Lebanese Military Intelligence, and some latitude for the "end users" in the area of the crime... in a specific building, with 3 floors...ideally situated for the surveillance and execution of the crime... etc.etc. etc. was to serve his AMERICAN HANDLERS... well, very well , until 2005. 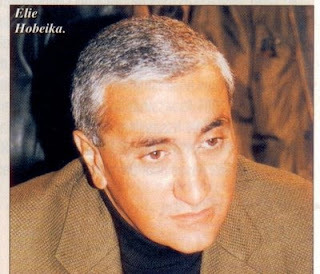 It is noteworthy that the State Department's list of global terrorist incidents for 2002 worldwide failed to list the car bombing attack on Hobeika and his party. The White House wanted to ensure the attack was censored from the report. The reason was simple: the attack ultimately had Washington's fingerprints on it. It might be of public interest to know that a significant number of Israeli Mossad agents are now working in the United States as employees of the Central Intelligence Agency. These agents, some of whom are listed below, are initially paid by the Israeli Embassy in Washington but Israel then bills the U.S. Government for the salaries and is reimbursed in full on a monthly basis. Go ahead you know you want to see. Just scroll down. It's a long story. Peasant today I was looking at a sports forum that had a thank you for your service post. You know have a beer and put the steak on the barbie. I left a link to Smedley Butler, Duff, and the murder of Pat Tillman. Tillman since they used the Pat Tillman foundation in the spiel. I said thanks for your support being a veteran myself but it would please me much more if people looked into why some of these wars were being fought and people killed. Well you know the rest they said can we please just thank the veterans and not make it political. I erased the post and left them with an O.K. it is great to be a veteran, carry on. Unfortunately America has way more of their quota of thess type clowns. totally dubs. there's a lot of deep-felt knee-jerking type movements. zombie nation. Here is one from bho. Why wouldn't Germans want their country turned into a nuclear waste dump? I have seen the name of the messiah on the bit of paper and I don't see the problem in telling you it was Tom. Unfortunately it didn't say which Tom. My current policy is that whenever I meet someone called Tom, I'm nice to them. I mean, you never know, he could be it. CIA and Mossad in bed together. dubs, thank you for the video. i read about the protest at Jane Burgermeister's site the other day and was impressed that the people were able to prevail. aan, yes totally. mossad on the payroll, our payroll.